Peel potatoes and cube. Remove seeds from bell pepper and dice, along with the eggplant. Peel ginger and chop finely. Peel and mince garlic and slice scallions. Heat enough oil in wok or sauté pan to cover vegetables when added. 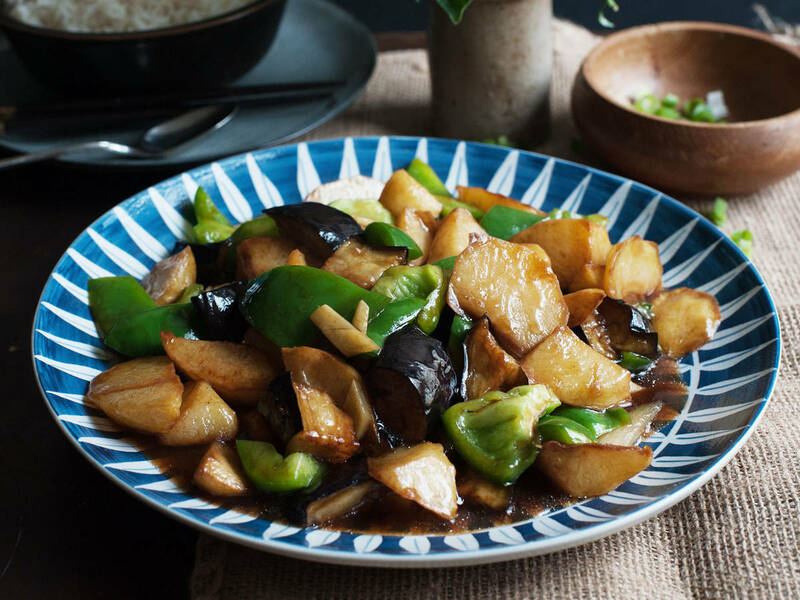 Deep fry eggplant until golden brown, remove with a slotted spoon, and transfer to a paper towel-lined plate to drain. Deep fry potatoes until golden brown, remove with a slotted spoon, and transfer to a paper towel-lined plate to drain. Pour out all but 1 tbsp. of the frying oil, then reheat wok over medium-high heat. Add scallion, ginger, and garlic to pan, then add fried potatoes, bell pepper, and some water. Stir for approx. 1 min. or until fragrant, then add sugar, salt, oyster sauce, dark soy sauce, and white pepper to taste. Add eggplant and cook for approx. 1 more min. Enjoy!